Gakatiyi - Indian Word Meaning for "A Place of Setting Free." Large Screened in Porch with Outdoor Burning Fireplace. 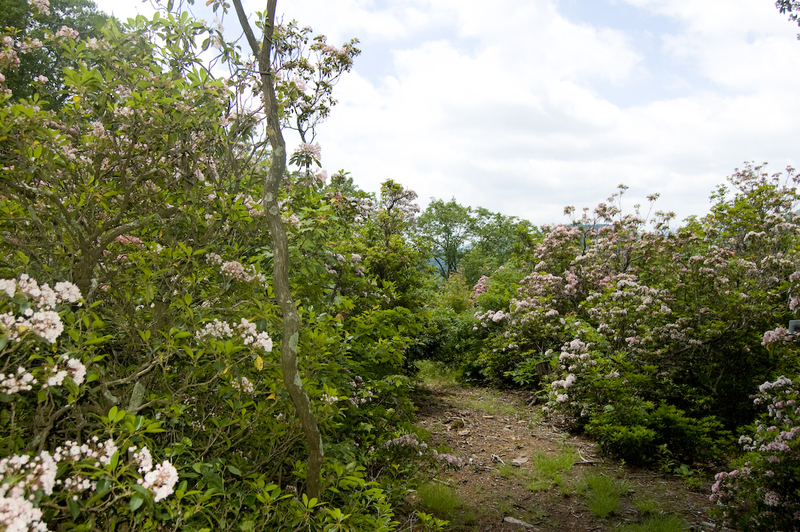 Walking path through the mountain laurels. 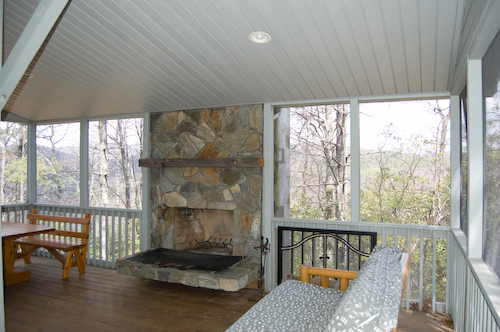 Screen porch offers outdoor seating, wood burning fireplace and all around mountain views. 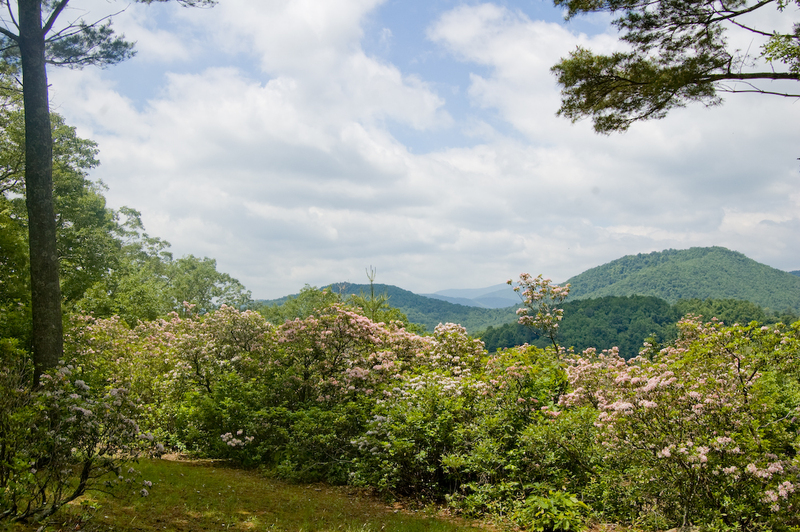 Perched on the side of a mountain and tucked among native hardwoods, rhododendrons and mountain laurel is "Gakatiyi," a Cherokee word meaning "a place of setting free." If freedom from the daily grind is what you seek then you couldn't have planned a better escape. 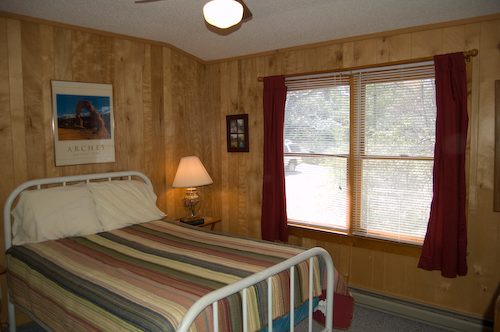 Lots of activities and attractions are waiting and all within a few minutes' walk or drive. The onsite community lake is perfect for a morning of fishing, the lake is stocked and offers hours of catch and release entertainment. Or delight in a leisurely paddle, a refreshing afternoon dip or an evening BBQ at the lakeside gazebo. 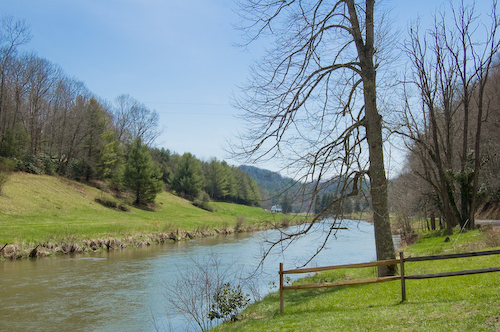 You'll also want to save time for a nature hike through the wooded ravine to the community waterfalls or take pleasure in a scenic float down the New River only minutes away. River access is available to vacationers with plenty of parking and canoe, kayak and tube rentals are available in nearby Todd if you don't want to bring your own. Meandering approximately 10 miles from Fleetwood to Todd alongside the New River is scenic Railroad Grade Road, a local favorite for bicycle touring. In Todd you can also find the well-known Todd General Store and Cook Memorial Park where you can enjoy folk storytelling, bluegrass on Friday nights and numerous music and art festivals throughout the year. Check out calendar of events section for a full list of area happenings. Year round adventure awaits and "Gakatiyi" is the perfect place to call home as you explore everything the High Country offers. Inside your "home away from home" you'll find three levels of living and plenty of space for all your family and friends. When you open the doors you'll be greeted by the window filled living room where you can enjoy majestic views and the fire's warm glow. The combination kitchen / dining area is a cook's dream and off this area you'll find the signature screened porch with comfy outdoor furnishings, picnic table and a massive wood burning outdoor fireplace. 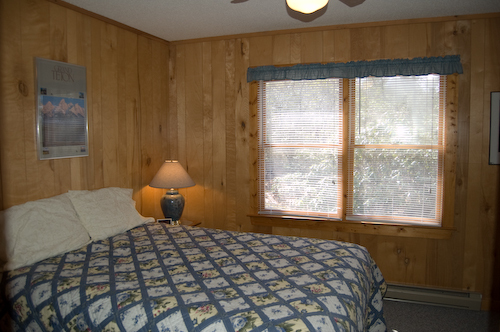 On this level you'll also find a spacious bedroom with queen size bed and separate full bath. On the upper level you'll enjoy a loft area with sleeper sofa, full bath and bedroom with double size bed. The lower level is roomy and open with queen size bed, media room and laundry area. With natural beauty, unique attractions and year round activities all within a short drive from this comfortable getaway you'll already be planning your next vacation. 20 miles to Boone, 10 miles to West Jefferson and 10 miles to Todd. "Always enjoy the big porch and fireplace. I have rented this place a number of times and am never disappointed. " "This home is much nicer than the pictures. They need to be updated and show more of each room. It was the perfect size for our family of 6. The extra space in the loft was a great hangout for the teens. The kitchen had all the cooking items we needed to prepare Thanksgiving dinner and the screened porch with fireplace is great!" "great except for rain all weekend"
"Gakatiyi Chalet is great for a small family. The place was immaculate and every single thing I needed was right where it should've been. More important, the house is designed to take full advantage of breathtaking views from the main room and decks. We hosted a family dinner on the wonderful screened in porch with fireplace. Love that the floor had been screened under the boards as well. Very thoughtful and bug-free. We'll be back." "I have rented this place several times over the years and have always enjoyed it, particularly for the huge porch and outdoor fireplace. On this trip I found the house to be in need of a little more attention to cleaning - carpet and upholstery - and I am sure the owner will attend to those needs soon." "the home is a little older,it has older appliances but it makes up for it with the wood burning fire place inside as well as on the screen in porch, and the view of the mountains is one of a kind, my wife and me will be back soon "
"Wonderful house! The covered porch and fireplace made the house - we spent all our time out there! It was in a great location and very comfortable. The only small issue was the inconvenience of having a separate large bedroom downstairs without a bathroom. Going up two flights to the other bathroom was inconvenient. " "Very beautiful surroundings. Great place to stay for the weekend and unwind. Three couples were very comfortable with plenty of room." "The rain and cold did not prevent us from having enjoyable stay for a week in September at Gakatiyi. The views and the peace and quiet of the neighborhood were what we needed. The chalet had all the amenities we needed for a comfortable week's stay. The property owners and the management company were extremely accommodating when we needed to cancel a stay earlier in the year due to a family tragedy. Will definitely be a returning guest. "I was pleasantly surprised by this home. The pictures did not do it justice. We rented it primarily for the porch, view, and location and ended up loving the house itself and the porch and view were beyond our expectations. Everything was clean and comfortable. We had 2 teens and 2 young boys in tow and everything wasn't so new that we couldn't relax. It was nice but felt like a home. Highly reccommend! Make sure the brakes on your car work well, it's a long way up and down, and don't expect a large amount of area for kids to play in as it's a small property, but a fork of the New River rests at the bottom of the development and it was perfect for fishing. We plan to return as soon as possible!" "We had a wonderful stay at Gakatiyi. 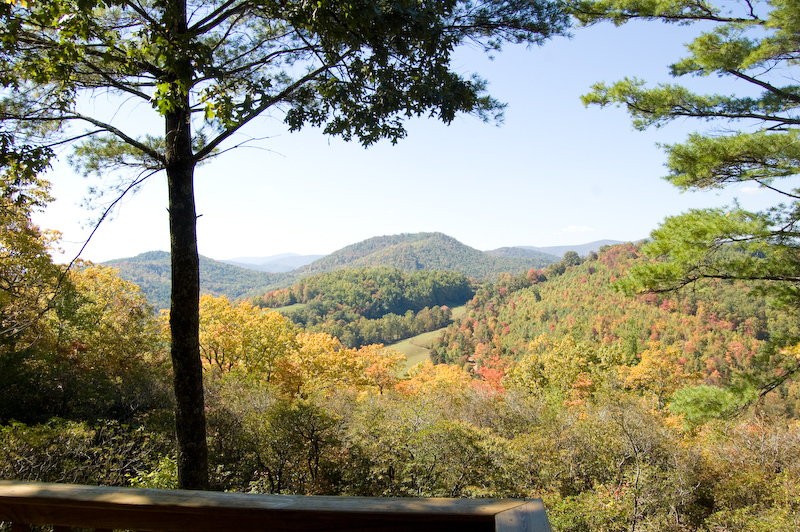 The view was spectacular and the outdoor fireplace on the screened-in porch was awesome! The house was very clean and check-in/check-out was very easy! Would definitely stay here again." "This is the perfect place to get away from it all. the best part was the screen porch with fireplace." "We enjoyed Gakatiyi very much! 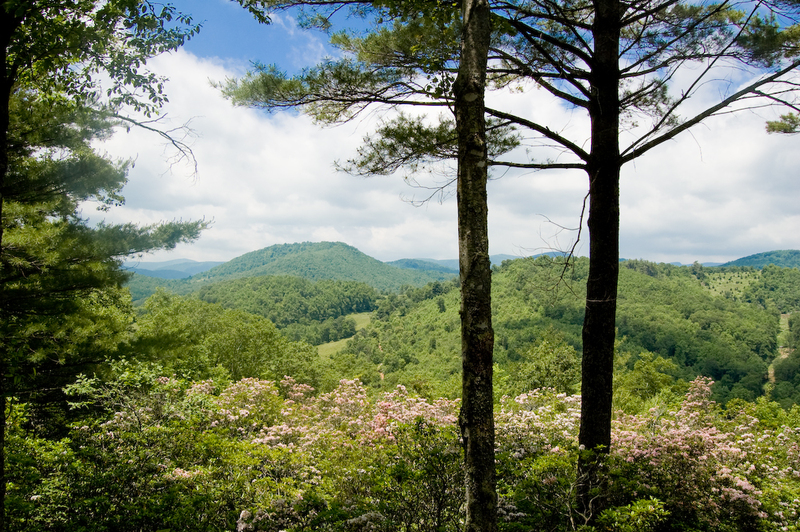 The views of the Blue Ridge are excellent. 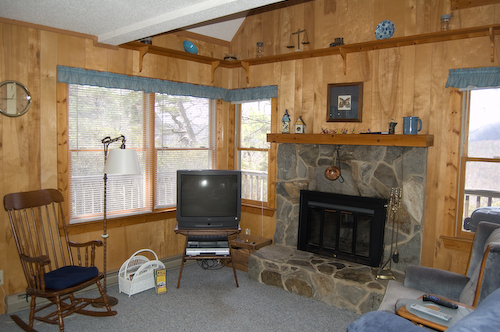 We especially enjoyed the screened in porch with fireplace. Would gladly return!" "I've now done two extended stays at Gakatiyi, and everything has been perfect. The house itself is wonderful, the view is hard to beat, and the property management staff is very accommodating." "Had a lovely stay at this property. Enjoyed the coziness the cabin offered and the views were stunning. " "we were very happy with the cabin. the area is wonderful and we had a wonderful time. will be doing this again"
Thank you for your review and we hope to see you soon! "We had a great stay at the Gatakiyi cabin in Fleetwood Falls. The view was fantastic! I suppose the only drawback was the lack of AC. It was an extremely hot weekend - even in the mountains & we had a couple of hot nights. " "Pros: Great views. Great screened-in deck with fireplace. Functioning kitchen. Cons: Basement bedroom has strong mildew odor (worked with us because with 4 of us staying there, we didn't need to use it). Insects in cabin - needs better pest control approach." "Overall we had a great stay at Gakatiyi over Memorial Day weekend. The screened in porch is perfect and that is where we spent most of our time. There was a bit of an ant problem in the kitchen but other than that the house was clean though a little dated. We will stay again!" "House was as seen in the pictures on the website. HUGE screened in porch, but a little cool at the time to really use. Only problem was barking dogs in the valley ... you could only barely hear in the house, but on the deck it was distracting for reading. Great view." "Great place! Had everything we needed. Nice amenities, great view! Nice, quiet neighborhood. Reservation process was very smooth and agent was very nice with good communication. We will be back again. " "The location of the property was great. It was very convenient to get to all the places we needed to get to .. My family and I stay for Christmas weekend and the view from the porch was priceless .. Unfortunately we could do anything that had to do with snow because of the temperatures but that has nothing to do with the property. I do recommend you get there during the day it's very hard to get to the property at night... We had a great stay "
"Nice location with easy access to Boone, and App. State. Enjoyed our stay. Spent the majority of our time on the large porch in the evening when at the cabin. Expect we will return on another visit to see our App. State student. 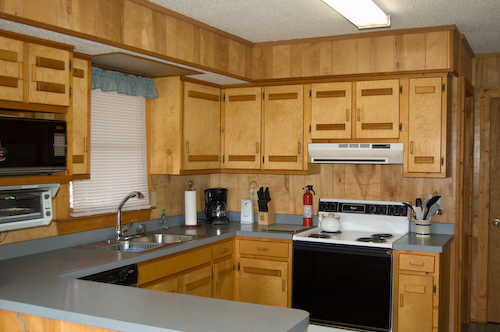 :) "
"The cabin was nice and fairly clean, but there was a problem with ants in the kitchen. The smoke detector also needed repairs. However, the porch area with the fire place was AWESOME! We spent most of our time as a family out there. " "Our weekend stay at the Gakatiyi was perfect. 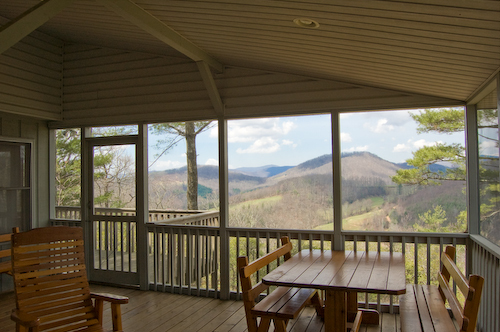 High up the mountain, we enjoyed the beautiful views and the screened in porch! We slept 2 couples, 2 children, and 1 teenager comfortably. We forgot to ask about air conditioning and were a little concerned when we did not have it, but there were nice big fans to use at night. Highlights: Tubing & fishing in the New River, visiting the cheese factory & downtown West Jefferson, swimming in the lake, hiking up the falls & visiting with friends we had not seen in 25 yrs. Thank you for all your help in scheduling the perfect place for us! " "We loved it. The view was beautiful. The house immaculate and quite comfy. We would love to go back again and again. " 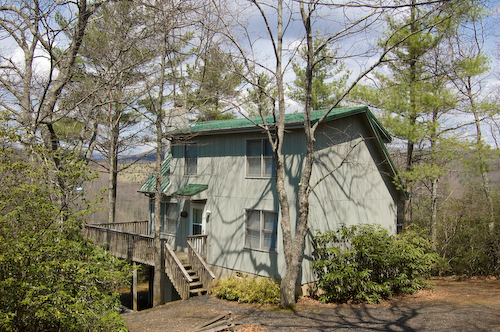 "Great place, views, screen porch with wood-burning fireplace. I'll be back." "Very nice house, plenty of room, and magnificent views!" "Nice and peaceful! Great view!" "My family and I stay in Fleetwood Falls several times per year, but this was the first time we stayed in Gakatiyi. The mountain views are fantastic, and the house had plenty of room for the five of us. There is a very large outdoor screened-in porch with a fireplace, rocking chairs and a couch. There was even room around the outside of the house for my kids to go out and play. A very nice place to stay, and we had a great time." "We had the best time on our Easter weekend vacation. We had no problems with the directions or the property.The house was really nice and views were wonderful! We especially enjoyed roasting marshmallows and the fire in the outside fireplace at night! The price for the location was well worth it. 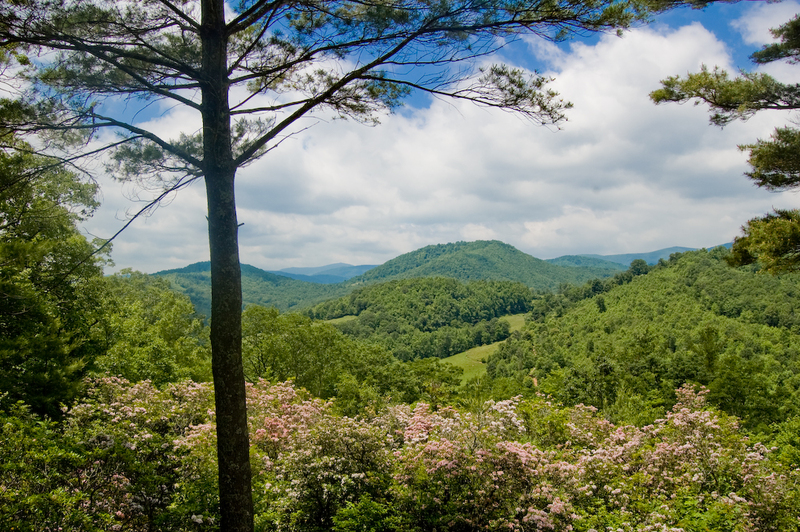 It was in a community that made you feel like you were far away from the world but you were close to alot of nice area attractions that we visited like grandfather mountain, blowing rock, Linville caverns, Daniel Boone Inn etc. Planning on another trip to this cabin soon! " "Great vacation home. Loved the wood burning fireplaces!! Lots of room. BEAUTIFUL VIEWS!!!! We will be back!" "Truly a beautiful place to stay. The view was beautiful and showed lots of fall color. The beds were comfortable which is always a plus. The only thing that would have made it better would if I could have stayed longer. Thanks for allowing us to use your beautiful home. Thank you Jerrita at Ashe High Country Vacations for helping us with this rental always a pleasure working with you." 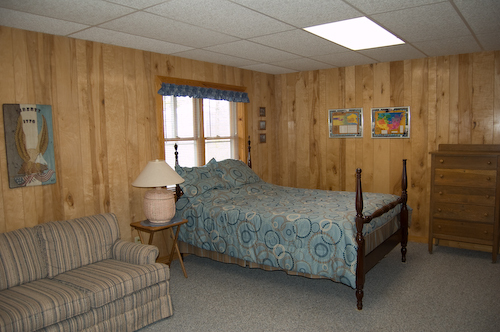 "Very nice place and very roomy, clean and extremely well stocked. We didn't know how to operate the DISH satellite but that's ok. Didn't have time to watch tv anyway. Wish we had more time to stay longer. Will definitely book again with this agency! " "As always very peaceful and enjoyable. We love the porch and views!!!" 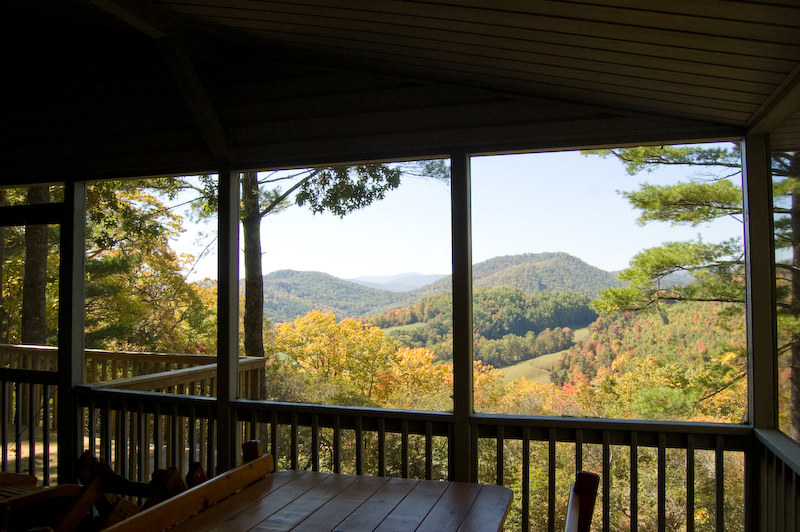 "The view from this cabin is amazing and the screened in porch is perfect for eating, socializing or just taking in the serenity. The neighborhood is well maintained and peaceful. The community lake was a great place to fish, canoe, and swim. The only thing that was a little frustrating was that there was a small sugar ant problem in the kitchen. We would love to stay in this cabin again. " "The view was amazing and settled in a quiet neighborhood. 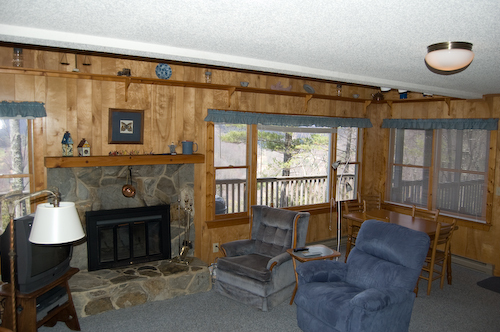 The cabin was well furnished and we enjoyed the outdoor screened in porch with the fireplace. Getting there was a bit of a problem. The Fleetwood Falls community needs a map to make it easier to get around. We were told that there was a "lake" with a charcoal grill. Well, it ended up being a pond with a charcoal grill and picnic table and the grounds were not well kept." "Great rental and also great support from property management company. Only disappointment was no wireless internet. We could not connect our IPads to the wired internet. Otherwise, a great time." "Absolutely amazing view. Accommodations were clean/neat with all of the necessary amenities included. The screened enclosed patio/porch was an added bonus. Looking forward to returning again." 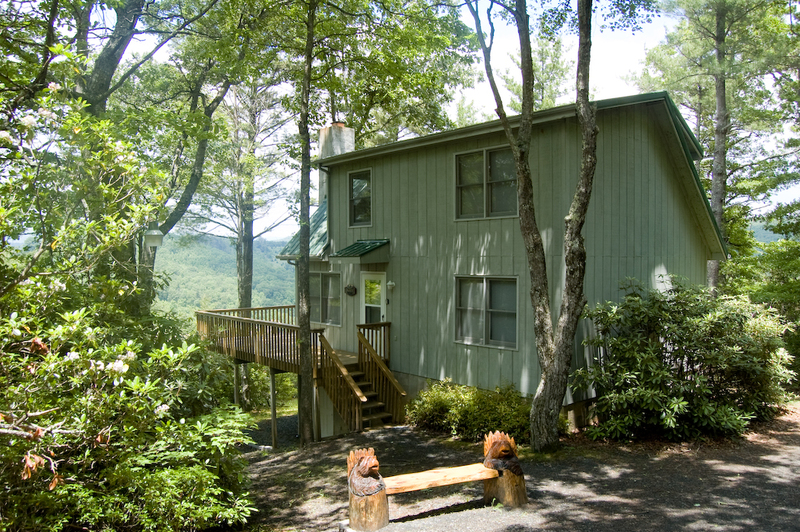 "The views are spectacular, the screened in porch with fireplace are very nice. A great place to stay for a great price!" "We had a great time at the Gakatiyi cabin. It was in a great location to enjoy the view of the mountains. 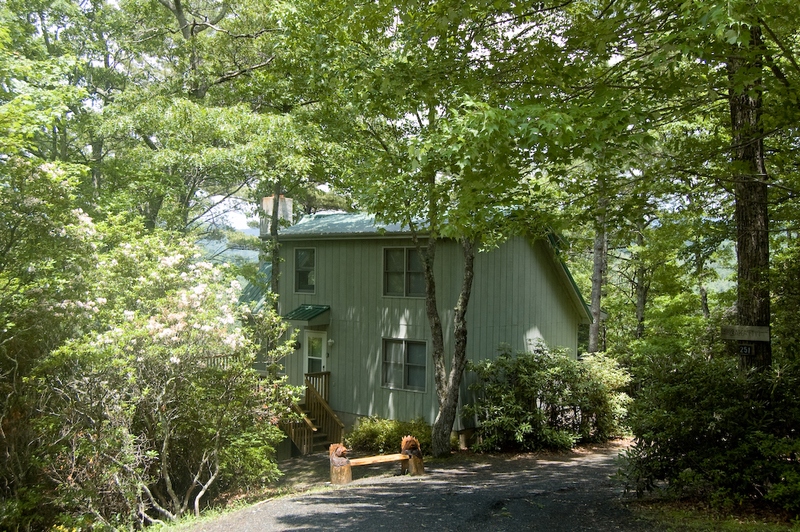 The cabin was cozy and the screened porch with fireplace was our favorite." 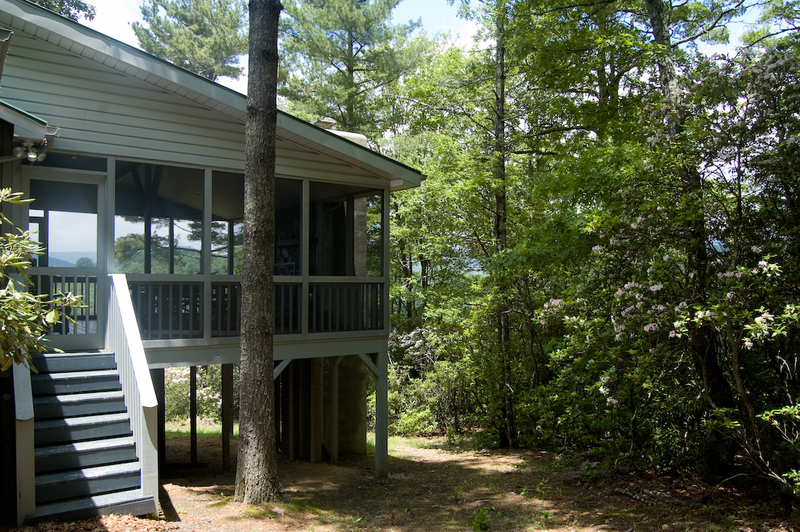 "We were very satisfied with the cabin, yes it is a little old, BUT the porch and the view make up for that. It was very comfortable. And we loved staying out on the porch. The mountain breeze comes up the mountain side and blows through the porch, so it was wonderful! Can't go wrong staying here. I will say the downstairs room in the basement was a little damp smelling and needs a dehumidifier going all the time."